48 Hours in NYC: What to see, where to eat, how to party. Inspired by his deep affiliation to NYC Chuck Ros from chuckandlori.com brings us the latest episode in the 48 Hours In series. Chuck’s extremely well-written guide focuses on Manhattan as New York City’s most sought-after destination for travelers. Packed with an abundance of information and travel tips it covers everything from cheap flights over New York’s world-famous hotdog culture to the movie set of Ben Stiller’s Night At The Museum. This episode is a chunky one as it is teeming with links, insights, information and tips that only a local could give you. I am more than sure you will enjoy this episode so let’s get right into it. New York City is like a giant magnet. Americans are drawn to their largest city by opportunity, whether the chance to hit it big acting on Broadway or the chance to hit it big on Wall Street. Opportunities for visitors also seem limitless, certainly more than can be realistically squeezed into 48 hours. Washington, DC may be America’s political capital, but the spiritual capital of the Land of Opportunity is New York City. 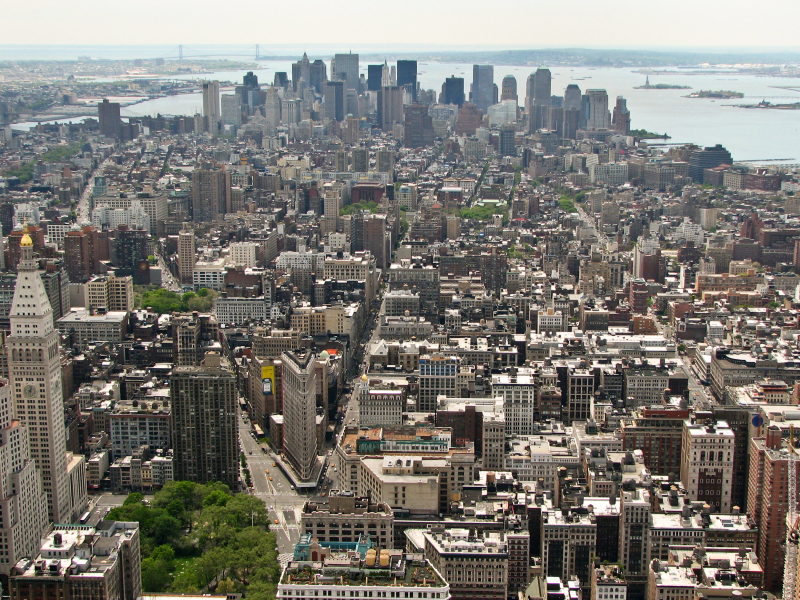 The Big Apple is aptly named: it’s a sprawling city made up of 5 “boroughs”. While Brooklyn, Queens, Staten Island, and the Bronx all deliver their own charms, short-term and first-time visitors are likely going to want to concentrate their time in Manhattan, so our New York City travel guide shall be a Manhattan travel guide. Manhattan is an island bounded by the East, Hudson, and Harlem rivers. It, like all 5 of New York City’s boroughs, is located within the state of New York, though the city of Newark, New Jersey lies across the river just to the west. New York is the anchor in the United States’ Atlantic seaboard, with Boston a few hours to the north, and Philadelphia and Washington a couple of hours to the south. New York City enjoys a varied climate, though it can be humid because of its proximity to the ocean. Winters are typically cold, though not brutally so: freezing temperatures and snow are common, but not a constant winter threat. Summers can be uncomfortable with high humidity and temperatures often hitting 35C. Summers are officially tourist season, though there’s good reason New York is also known as “The City That Never Sleeps”. Any time of year is likely to be busy, but for the best balance of crowds, things to do and weather, we recommend late spring (May to June) or early autumn (September). New York City is principally served by three busy commercial airports and a cadre of smaller airports. Visitors from Europe will most likely arrive at John F. Kennedy International Airport (known simply as “JFK”) or Newark Liberty International Airport (just “Newark”), though some European flights do arrive at LaGuardia. Flights from other American cities will probably also arrive at one of these three airports, but can also arrive at one of a half dozen other, smaller, and further out airports. 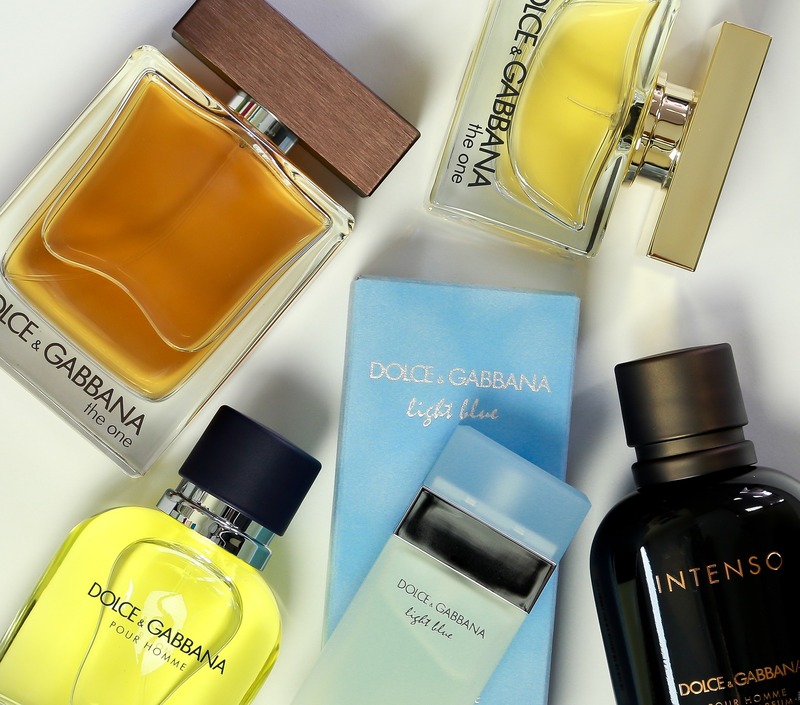 JFK: served by dozens of airlines, including every major European and American carrier, JFK is sleek and modern an d located closest to the Atlantic Ocean south of Queens and east of Brooklyn. The AirTrain train service will get you into the city in about 45 minutes, or you can have a cabbie take you directly to your hotel for about 53€. Alternatively, ride in style in a towncar from www.carnairportlimo.com for a fixed 42€. Newark: also served by dozens of airlines and many European carriers, Newark is a bit closer to the city, despite its location in New Jersey. Newark’s AirTrain gets you into the city a little more quickly at 40 minutes and is an easier connection. A cab ride will set you back about 53€, just like from JFK, but towncars run a bit higher at 52€. 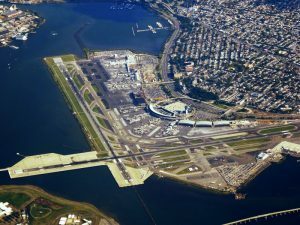 LaGuardia: being the closest to Manhattan isn’t really an advantage: LaGuardia is located on the city’s extensive rail and subway network, but going by train and subway will take you a bit longer, up to 45 minutes, except—that is—if you want to take a taxi, which will run about 36€. Towncars from LaGuardia are also the lowest at 38,50€ fixed. AirBerlin (London Heathrow to JFK from 745€ 1-way). Tip: Watch out for seasonal flights offered by airlines like Thomson and Condor. The German Lufthansa-affiliate of Condor is well-renowned for offering seasonal tickets to miscellaneous US destinations for as low as 99€. Be sure to check their website for all special offers that they have. You’re on vacation: don’t even think about renting a car in Manhattan. New York has one of the most extensive subway (metro) systems in the world. Utilize Google Maps to plan your routes and connections, or use New York’s MTA website. When all else fails, ask a local: New Yorkers are much friendlier than their reputation and almost always happy to show off their knowledge of their subway system. There are about a trillion hotel rooms in Manhattan. Midweek rates purchased in advance start as low as 55€ a night for 1-star hotels. But, as they say, you’ll probably get what you pay for. For a nicer stay at budget prices, plan on 110€ to 155€ at pay-in-advance, no-refund rates. There are also a few hostel options, and dorm stays start at 33€ per person per night; if hosteling is your thing, take a look at the Chelsea Highline Youth Hotel (184 11th Avenue). Hotel Edison (228 W 47th Street, from 143€). Rates, of course, vary based on season, day of week, and lots of other factors. All of these hotels are a block or two from Times Square. If you have a bit more flexibility in your budget, consider staying in either Greenwich Village or Chelsea. These neighborhoods are our favorites for walking, splendid architecture, trendy restaurants and shopping. There are a few thousand restaurants in New York, and these are just the ones listed on TripAdvisor. If you’re going to New York with fine dining in mind, you probably already have a short list of restaurants to visit. 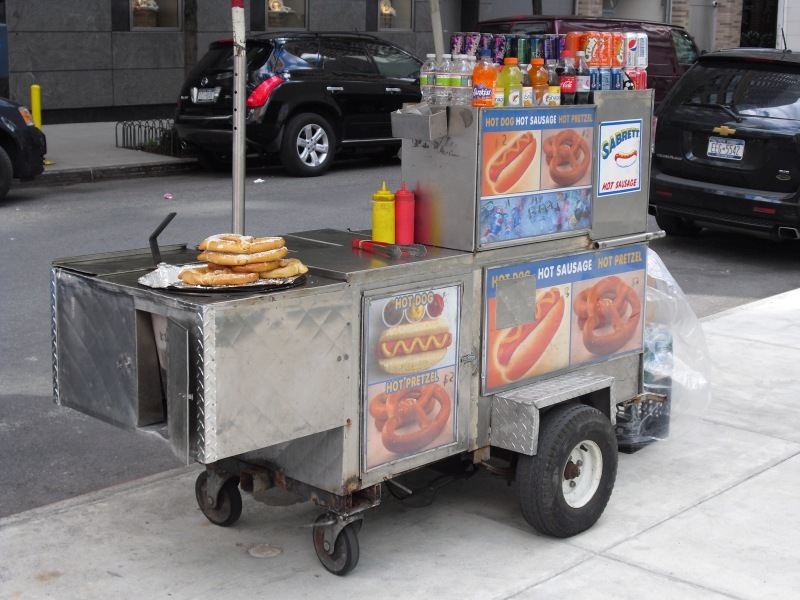 But for us, New York cuisine starts with pizza and ends with (believe it or not) street vendor hot dogs. New York pizza is big, hot, cheesy, but NOT doughy. If you want bready, thick-crust pizza, New Yorkers will quickly put you on a bus to Chicago. You can get pizza by the slice or by the pie almost everywhere you look in New York, but when we’re in New York, we head straight to Patzeria Family & Friends (311 W 48th Street) or Lombardi’s (32 Spring Street). Also everywhere you look are street food vendors. With the explosion in popularity of street vendors and food trucks, you can get anything from Turkish döner to sushi, but it’s “the dogs” we crave. 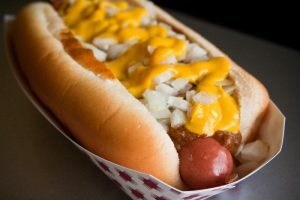 Famous store-review site Yelp even has a hot dog cart search with 100+ pages of results, often with names like “Cart on the corner of X street and Y avenue”. Read a few of the reviews on the first few pages: these hot dog guys have some fanatic regular customers! Our recommendation is to keep it simple: nothing beats a great red link with mayonnaise, mustard, onions and relish (except, of course, a second one). …and the dog (with onions, roasted onions and sauce). New York more than deserves its reputation for nightlife. 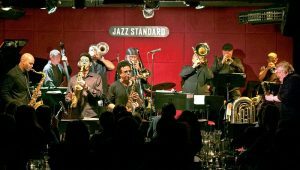 Whatever your evening entertainment preference—dance clubs, jazz clubs, comedy clubs, smoking clubs—you’ll find them in abundance in Manhattan. So for the more manly men among you, and before we get to the abundance of things to do in Manhattan, we will dive into the borough’s thriving nightlife. Unlike in most other parts of the US, almost every club in Manhattan will stay open until the wee hours of the morning. Go early to drink at happy hour if you’re on a budget. And be sure to get your smokes in outside before you go in: a smoking ban has relegated tobacco use to a handful of smoking and cigar bars. For a pub-crawl type experience, we suggest concentrating your time in the Chelsea and Greenwich Village neighborhoods (which happen to be the same neighborhoods we like for hotels, so you can stumble back to the comfort of your room after a night out). 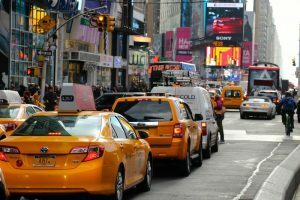 Every area of New York has its own flavor of nightlife, though, and we also like the area around Times Square (where Broadway actors often hang out after shows), and the Lower East Side (which happens to be where you’ll end up if you follow our daytime activities guide). If dancing is your thing, your best bet is the Meatpacking District (no pun intended, it’s actually the name of the neighborhood). There’s no need to go early: nobody dances until around midnight. Dress sharp and bring plenty of cash for both the cover charge (expect 18€) and drinks. Santo’s Party House (www.santospartyhouse.com, 96 Lafayette Street, Canal Street Subway). Inside the Jazz Standard on 116 East 27th Street. Swing 46 (www.swing46.com, 349 W 46th Street, 49th Street Subway). Dangerfield’s (www.dangerfields.com, 1118 1st Avenue, Lexington & 59th Subway). New York’s bars and nightclubs are at the constant whim of American trends. 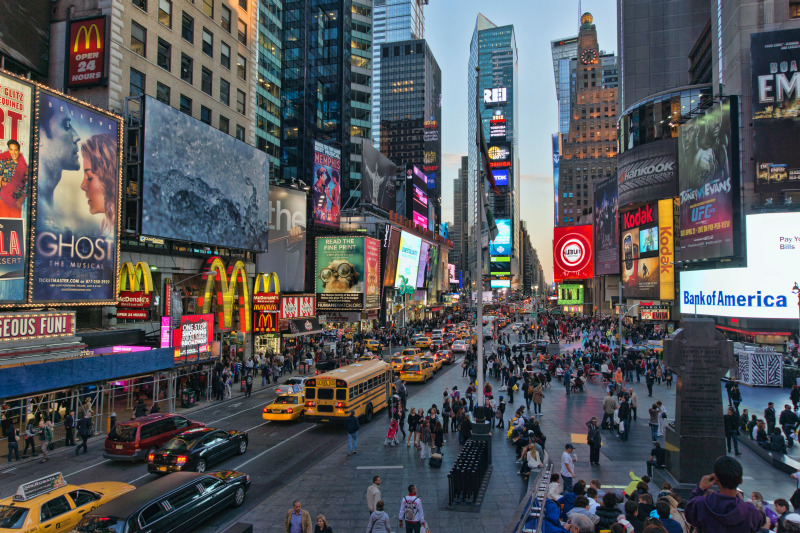 For the latest info on where to go and what to see when you visit, check out Time Out New York or just ask some locals. All in all, New York City, and Manhattan in particular, offer some of the most diverse activites in nightlife that in Europe might only find their counterpart in a city as big and diverse as Berlin. We’re going to start at Central Park and work our way south. Itself a sight to see, Central Park might not be the largest park in the world (not even in the United States) but it’s iconic for New York and it’s full of great art and vistas combining land and cityscapes. If you like parks and have some time, consider taking an organized tour. Flanking Central Park at about 80th street are New York’s prime museums. 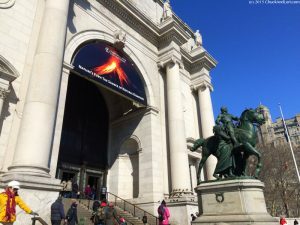 On the west side of the park you’ll find the American Museum of Natural History, made wildly popular in recent years by the “Night At The Museum” movies, and the Hayden Planetarium (81st Street-Museum of Natural History subway station). The Planetarium offers fascinating programs on topics in cosmology that change from time to time (tickets required: arrive early and get your tickets quickly). Getting through both the museum and the planetarium will require a half-day, more if you’re a science nut. On the east side of the park you’ll find the Metropolitan Museum of Art (also 81st Street-Museum of Natural History subway stop, just enjoy a walk across the park). Known to New Yorkers as “The Met”, this expansive, world-class museum stands toe-to-toe with Europe’s big museums like the Louvre, the Vatican Museum, the Prado, and the British Museum. Check at the information desk upon arrival for the tour schedule. Plan on at least two hours; art-lovers can easily spend an entire day here. From the Central Park area, head south to the Times Square (the Times Square – 42nd Street subway station). Times Square isn’t a true square or plaza by European standards, but rather just the intersection of Broadway and 7th Avenue. Times Square gets its name from the Times Building, the former 25-story headquarters of The New York Times newspaper which is now better known as the site of the crystal ball drop every New Year’s Eve. Spend anywhere from 15 minutes to an hour snapping pictures and keep an eye out for a naked cowboy. If you like theatre, the blocks surrounding Times Square rival London’s West End for the variety of offerings, from comedies to dramas and musicals, an area that sees world-famous Broadway as its center. You can sometimes get great last-minute ticket deals at the theatre ticket windows, but to ensure you get to see a show you really want to see, buy online in advance. If you don’t have a particular show in mind, but are interested in seeing something, consider one of the “classics” like Chicago, Phantom of the Opera, Wicked, or Jersey Boys. From Times Square we recommend you go up-to the top of a skyscraper. We have two suggestions. First, there’s the iconic art-deco Empire State Building (34th Street – Herald Square subway station). It’s one of New York’s most-recognized sites and the views of New York are spectacular, well worth the the impressive 28€ for some great photos. Alternatively you can go to the Top of the Rock, the observation deck of Rockefeller Center. The views are just as good and can even include the Empire State Building. If you have plenty of time, do both! The rest of our recommendations are all in “lower Manhattan”, the southern tip of the island. Once there, you can walk to all the sites we recommend. Start at the World Trade Center site (World Trade Center subway stop), where you can view the park where the World Trade Center towers stood, tour the 9/11 Memorial Museum, and get a look at the new Freedom Tower. Now walk the 3 blocks to Trinity Church (75 Broadway), possibly the most recognizable church in America, on your way to Wall Street and the New York Stock Exchange. You’ll likely be surprised that America’s center of commerce and capitalism is not much more than an alley. Unfortunately you can’t tour the exchange any more, but you can get some good pictures of the flag-draped building and be sure to look for the statue of a bull that is the symbol of American economic optimism. Make your way from Wall Street to the Whitehall Ferry Terminal (head south on William Street, turn left on Broad, right on Water Street). Take the next Staten Island Ferry for the best free ride in New York. The ferry runs around the clock: hourly at least, but every 15 minutes at rush hours (schedule here). On your way from Manhattan to Staten Island and back, you’ll have splendid views of the Statue of Liberty. Unless you have some things you want to see on Staten Island, just stay on the ferry and return to Manhattan. As you return to Manhattan, look up the East River to the right of Manhattan: you’ll spot another of New York’s icons, the Brooklyn Bridge. Once back at Manhattan, if you want to get a closer look at the bridge, head to Pier 15 and the East River Esplanade (walk north on Water Street, turn right at Fletcher Street), a great spot for a picnic and a stop for New York Water Taxi’s, a nice way—if you still have any time left—to wind down your 48 hours in New York. Want more from the same author? Be sure to check out Chuck ‘s Website with an abundance of great travel tips.